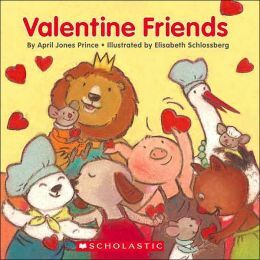 I love doing Valentine’s Day storytimes for little ones, because there are so many great books about hugs and kisses and love. Five little valentines were having a race. He ran fastest to the valentine box. This valentine is shaped like a square. This valentine is shaped like a bear. This valentine is shaped like a circle. This valentine is colored purple. This valentine is shaped like a rectangle. 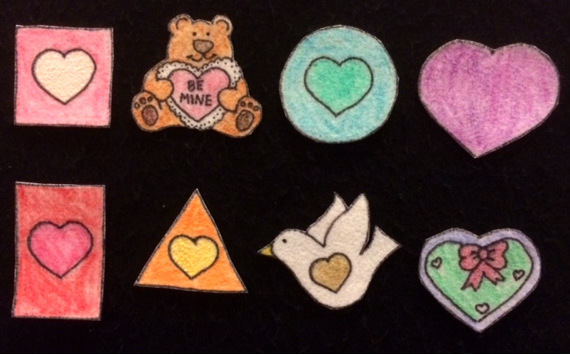 This valentine is shaped like a triangle. This valentine is shaped like a dove. 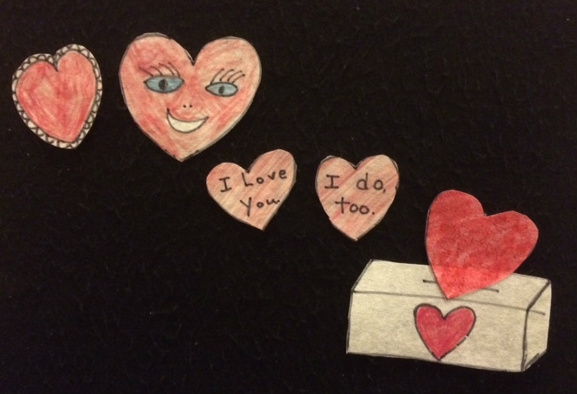 This valentine is made with love. This was a good storytime. I like Baby Loves Hugs and Kisses a lot, because it is not only about kissing mommy, but all family members. Also, seeing the baby hug things is funny — Too bad it is no longer in print! A Kiss Like This is also a complete winner. The kids were being attentive, and since the books were rather short today, I threw in an extra flannelboard. Fun! One of the measurements I use to judge how successful my Valentine’s Day storytime is with an elementary school group is how many “ewwww”s it evokes. 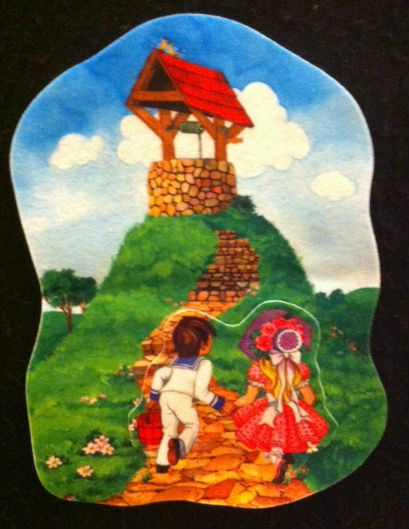 ‘Cause there is nothing early elementary kids like better than romance. Judging on that criteria, this storytime seemed like a hit. 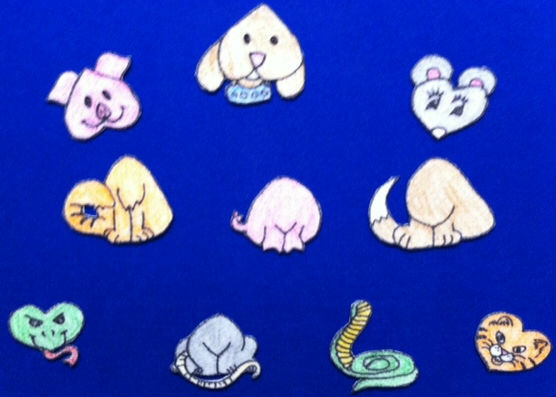 Patterns and Story from A Storytime Year, by Susan M. Dailey. For the story, see this blog post. This was a pretty fun storytime. 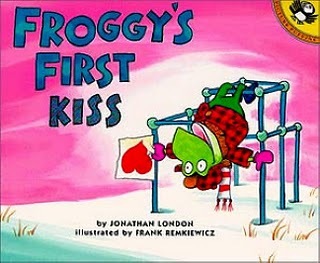 It’s always great to hear the reaction of the kids when you read Froggy’s First Kiss and get to the kissing scene. Since The Yuckiest, Stinkiest, Best Valentine Ever is a new book, this was my first time trying it out with a group, and I really thought it worked great. I think I can use it as a second grade pick as well. 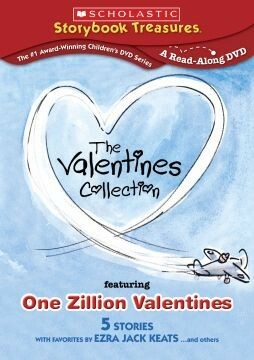 I need more Valentine’s stories for the older groups – a lot of what I’m familiar with is for the young ones. 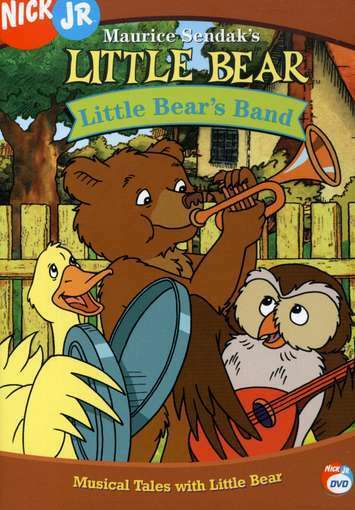 In hindsight I think I should have shown One Zillion Valentines as the movie, because Little Bear was a little too young for this group. This week at Flannel Friday we’re spreading the love of Valentine’s Day! I’m sharing a story I use often around this time of year, Vincent’s Valentine Animals. 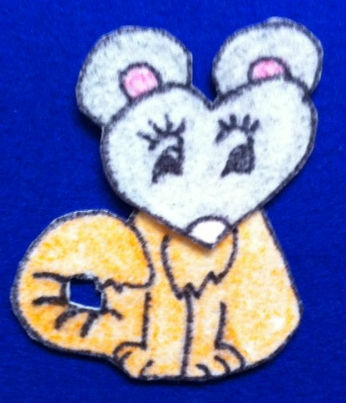 It’s not too mushy, and the kids can make fun animal noises with it. This is another flannelboard story that I got from my mother after her retirement from librarianship, so I’m not 100% sure on the original source. It’s on page 28 of A Storytime Year, and while I haven’t verified to make sure this is the correct book (we don’t have a copy in my system) I think it is by Susan M. Dailey. One day, Vincent the toymaker received word from the King that he was to create a special toy for the Princess for Valentine’s Day. Vincent knew a lot about making toys, but he had never made a Valentine toy before. So he thought long and hard and finally had an idea! He cut out hearts from wood, glued and painted them. 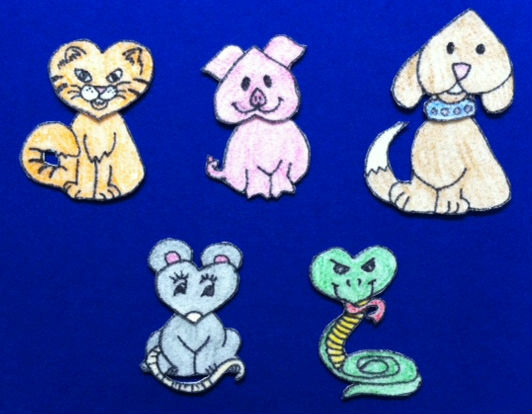 He made a Valentine cat, dog, mouse, pig and snake. And to make them extra special, he gave them each a sound. The cat said, “Meow”. 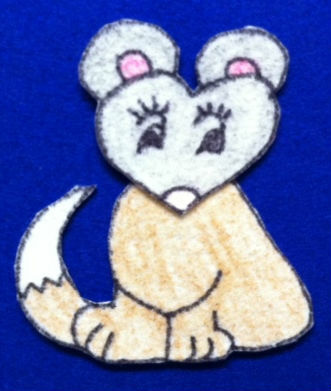 The dog said, “Arf”, the mouse said, “Squeak”, the pig said, “Oink” and the snake said, “Hiss”. Vincent was very proud of his animals, and couldn’t wait to give them to the Princess. 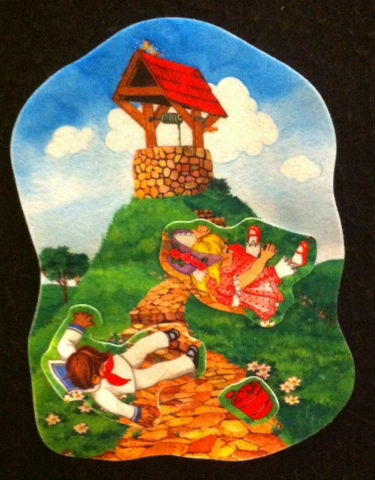 But he was in such a hurry to get to the castle, he stumbled and all the heads and body’s became separated. The toy said “Sque-arf!” Oh no, that can’t be right! What about the next body. The toy said “Sque-Oink!” No no no. 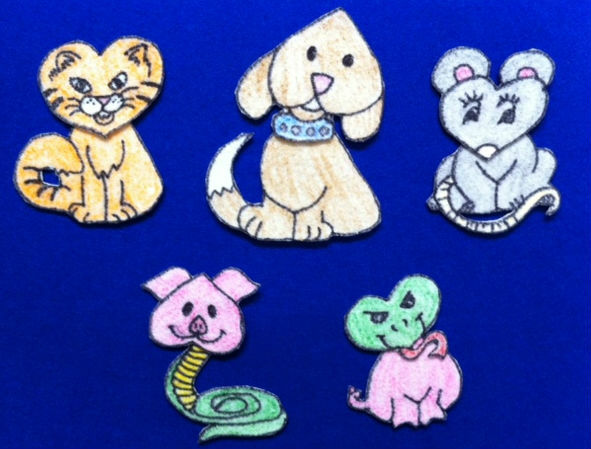 Let’s try this one… “Sque-Eow!”… Continue doing this with the various pieces until you match the cat, dog, pig and mouse correctly. Then continue the story. But Vincent heard the King impatiently calling for him. He couldn’t keep the King waiting! In a hurry, Vincent gathered up all his Valentine animals (take all the animals down from the board and put them up momentarily as you name them one by one) and brought them to show the Princess and the King. And they were both very pleased. The Princess loved her Valentine Cat. She loved her Valentine Dog. She loved her Valentine mouse. 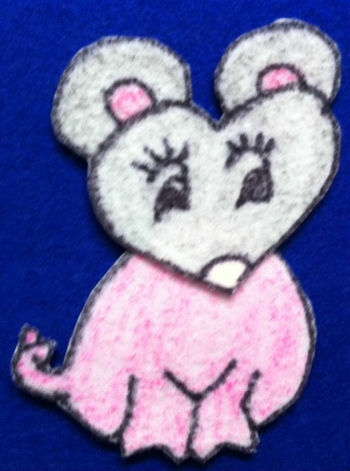 But here favorites were the Valentine pig-snake who said, “oin-hiss” and the Valentine snake-pig who said “hi-oink”. When she heard those noises, she laughed and laughed. Today’s Flannel Friday roundup is sponsored by Sarah at Read it Again. For more information on Flannel Friday, visit the Flannel Friday blog or Pinterest page.